We all need to hydrate ourselves in the morning, but few of us eat fruit for breakfast. We usually opt for heartier foods, like eggs and cheese. And yet if you try having savory fruit salads for breakfast, you’ll find that they’re very satisfying. 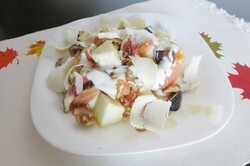 This morning I enjoyed a new invention of mine, a salad I based on several tried-and-tested food pairings: melon and prosciutto, which I translated into melon and smoked salmon; yogurt, walnuts, and honey, figs and Parmesan, which I turned into figs and Grana Padano cheese. The portion pictured turned out to be too large, by the way, but as I spent that day walking about town, eating a larger breakfast was a good idea. Here’s what’s so great about this melon and fig salad nutrition-wise. Disclaimer: I am not a medical professional and the health information presented on this page is not intended as medical advice. Galia melons are a cross between cantaloupes and honeydew melons. They are high in vitamin A (53% DV), vitamin C (66%), potassium (6%), and fiber (11% DV), and they have only 36 calories per serving size (1 cup of diced melon, or 177 grams). Vitamins A and C are antioxidants, which protect the body against oxidative stress; without enough antioxidants in our diet, our body is vulnerable to diseases like cancer, diabetes, and Alzheimer’s disease. Potassium helps reduce blood pressure, and fiber helps your digestion and reduces your LDL (bad) cholesterol. I used 890 grams of melon in my salad, so that’s 142 calories. Figs are also a good source of fiber, about 6% DV per fig. And 100 grams of figs have only 74 calories, or thereabouts (I imagine it varies with each cultivar). Although delectably sweet, figs contain chlorogenic acid, which lowers blood sugar. They also contain small amounts (1% to 4% DV) of various vitamins and minerals. I used a fig containing 37 calories. The salmon comes with a good amount of EPA and DHA Omega-3 fatty acids: 261 mg per the 50 grams included in this salad. The recommended doses of these acids, which lower your triglycerides and increase your HDL (good) cholesterol, vary with the source and the user. For younger people with no heart problems 500 mg may be enough, while people with heart disease and high triglycerides should take more, up to 1,000 mg, or even 1,800 mg, according to some medical professionals. Very high doses of fish oil, however, may increase the risk of bleeding, so talk to your doctor if you feel you should or shouldn’t take higher doses of fish oil. Another thing you should be mindful of when you consume smoked salmon is that a serving size of 136 grams contains 44% DV sodium. That’s only 16% DV for 50 grams, but if you’re carefully watching your sodium intake, even that may be too much. But smoked salmon is not only about omega-3 (and omega-6) fatty acids and sodium. It also contains high amounts of B vitamins (among them, riboflavin at 8% DV, niacin at 32% DV, and vitamin B6 at 19%), vitamin E (9%), magnesium (6%), iron (6%), phosphorus (22%), selenium (63%), and other minerals, as well as protein (25 grams per serving size). You should also note that smoked salmon contains a small amount of saturated fat (6%). Fifty grams of smoked salmon contain 58 calories. 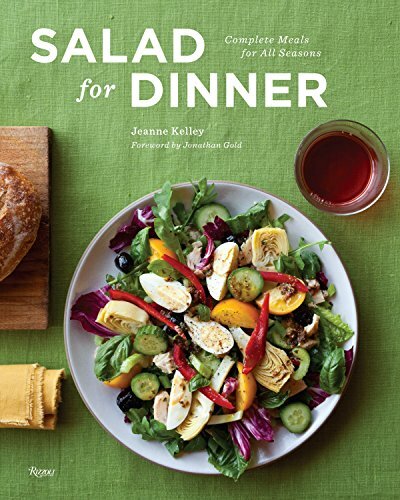 For this salad you need about 30 grams of Grana Padano cheese shavings. That’s 115 calories, from 9 grams of fat and 10 grams of protein. It’s usually recommended you limit your intake of fat to 70 grams (for a 2,000 calories total per day) and 0.8 grams of protein for each kilogram of body weight. For 65 kilos that’s 52 grams of protein. So 9 grams in 30 grams of Grana Padano is not very much – but enough to keep you full for several hours. This amount of Grana Padano cheese also contains 32% DV calcium and 7% DV vitamin A. You may be surprised to learn that of all the ingredients in this salad, it is the walnuts that bring the heaviest caloric punch, which is why you should use them sparingly. I probably used too many: 50 grams, or 326 calories. Walnuts are quite a powerhouse nutritionally. One serving of 117 grams has 76 grams of total fat (note that only 7 grams of that is saturated fat), 8 grams of fiber (31% DV), 17.8 grams of protein (36%), and large amounts of vitamins and minerals: thiamin/vitamin B1 (27%), riboflavin/vitamin B2 (10%), niacin/vitamin B3 (7%), vitamin B6 (31%), folate/vitamin B9 (29%), pantothenic acid / vitamin B5 (7%), calcium (11%), iron (19%), magnesium (46%), phosphorus (40%), potassium (15%), zinc (24%), copper (93%), manganese (200%), selenium (8%), to name just the better-represented ones. Pretty amazing, huh? And I haven’t even mentioned the omega-3 (and omega-6) fatty acids: 10, 623 mg (and 44,567 mg) per serving. Compare that to 711 mg (and 642 mg) for salmon. This last bit of research surprised me too, but one serving of walnuts is 117 grams, which is quite a lot. Doctors usually recommend only several walnuts a day, which probably has something to do with the fact that out of 765 calories for a serving, 639 come from fats. That's 117% DV, out of which saturated fats make up 36% DV. What’s so special about omega-3 fatty acids? These essential fatty acids, which we need to get from food (our body can't make them on its own), are very important to the good health of your heart as they increase your HDL (good) cholesterol, reduce your triglycerides, and lower your blood pressure if you have hypertension. But these fatty acids also help your memory, fight inflammation in the body, increase insulin sensitivity, and reduce the risk of Alzheimer’s disease, to name just a few of their other health benefits. Some medical practitioners and researchers argue that we should limit our intake of dairy, but I, for one, can’t give up cheese and a bit of yogurt. I’m trying to get milk and yogurt organic though, so as not to get all those antibiotics that the cows are given, or the hormones that are meant to increase their milk production, but I’ll continue to eat dairy, even as I do try to limit my intake of milk. Why? Because yogurt has many good bacteria which promote the health of the digestive tract and immune system. It also contains calcium (45% DV per serving), vitamin A (2% DV), vitamin C (3% DV), thiamin (7% DV), riboflavin (31% DV), vitamin B6 (6% DV), folate (7%), vitamin B12 (23%), pantothenic acid (14%), magnesium (10%), phosphorus (35% DV), potassium (16% DV), zinc (15% DV), and selenium (12%). Note that it also contains 7% DV sodium. One serving of yogurt is 245 grams. I used much less in my salad: 50 grams / 31 calories (for low-fat yogurt). I also added honey to my salad. Honey contains powerful polyphenols which boost the immune system and protect against illnesses like cardiovascular disease and cancer. It also contains thousands of enzymes. Besides the antioxidant polyphenols and the enzymes, honey is also rich in amino acids, vitamins, and minerals. It is, indeed, a complete foodstuff. 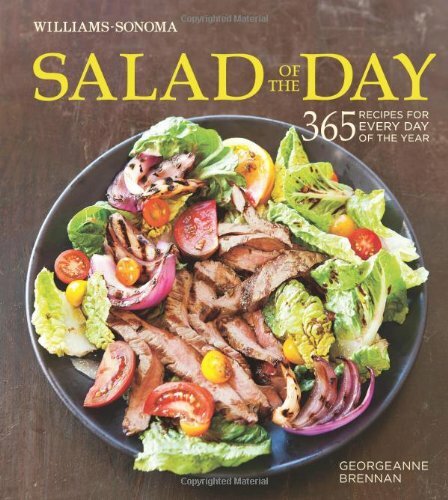 I used one tablespoon in my salad, which contains 64 calories. Adding up the calories, I get a whopping 715 (note, however, that a small pizza can have anywhere from 750 calories to 1,300 calories and more), but it will give you energy for a good part of the day. Enjoy! Frank and Veronica: Yes, I think this is a very energizing breakfast and one that covers many bases nutrition-wise. Fran this breakfast is great or you. It is ideal for me with my new eating plan. TY Mira. Question, Mira: this sounds like an interesting and credible breakfast for health conscious people, but I am a well built male who needs to consume enough calories to cope with the day. I like to take bread at breakfast, as it gives me energy. Even though I am losing weight the fact that I take extra large fittings in clothes indicates that I will remain relatively heavy. Would this breakfast suit one like me? This breakfast salad looks delicious. Thanks for the recipe. Minus the walnuts, which I hate the taste of, this sounds like an interesting salad and worth trying. Thanks for sharing the recipe. Yes, they have lots of vitamin A/beta-carotene and vitamin C. I read somewhere online that cantaloupe melons have the highest amount of beta-carotene per serving of all fruits! I don't know how accurate the info is, but Galia melons, for instance, have 53% DV betacarotene. They also have 11% DV fiber! melons are low fat and a great source of vitamin a and c .
This tasty chocolate dessert is easy to make. It’s done in less than an hour and requires only a few ingredients: dark chocolate, butter, eggs, sugar, peaches, and whipped cream.